I was playing around with some ghosting techniques I saw on YouTube this past weekend. I think they would do a lot better with glossy cardstock, but couldn't find mine and Stampin' Up! doesn't sell it anymore, so I used Whisper White cardstock. For the background, I used White Craft Ink with Pear Pizzazz ink brayered over it. I let the craft ink dry for a long time and even heat set it, but it still reacted with the Pear Pizzazz I used over it. I wasn't really happy with it. I used my aqua painter to splash some water over it. I liked the spots it left behind. 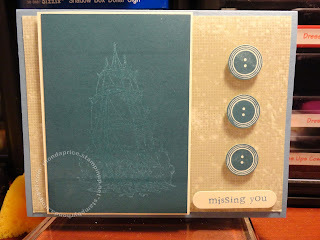 For the image, I used a retired stamp set that I love (Schooner). With this one I used Versimark and brayered over it with Island Indigo. The image showed up really faint. Made me think of missing someone, which is why this is a Missing You card. I thought this button stamp from the retired set Button Button went great. I layered the card front on a card base of Marina Mist. I think for my next ghosting technique I will try is using clear embossing powder and sponging around on the cardstock. Don't forget to check out Late Night Stampers Fall 2013 Treasure Hunt. I am offering prizes to a lucky follower, commenter, and customer.